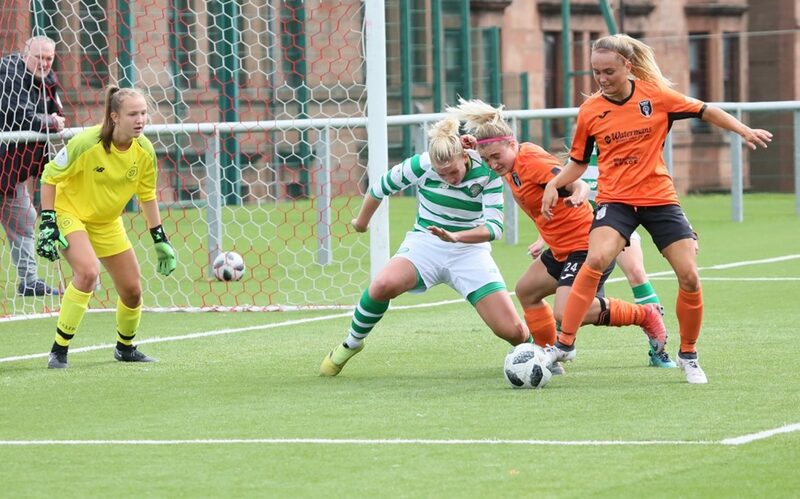 Hibernian held the SBS Scottish Women’s Premier League leadership on goal-difference, after they defeated Stirling University 4-1 and Glasgow City beat third-placed Celtic 2-0. 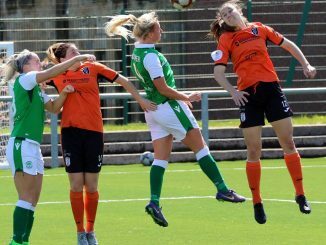 Hibs scored twice in the dozen minutes before the break, with Abi Harrison cutting back for Jamie-Lee Napier to finish and then Lisa Roberston volleyed home from 18 yards. Harrison got the third, Stirling’s Kendra Bonsall pulled one back on her debut but Hibernian’s new signings Beth McKay and Lauren Davidson linked up for the latter to net their fourth goal. 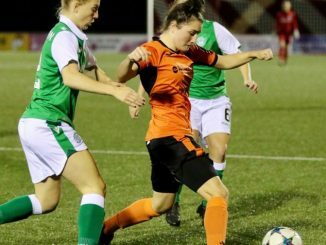 Glasgow City struck twice in a three-minute spell midway through the first half. Lara Ivanusa headed on a Leanne Ross free kick with Kathleen McGovern then turned into her own net, before Abbi Grant rounded the keeper to score from an acute angle. City now start their Champions League qualifiers against Anderlecht at Oriam on Tuesday. Forfar Farmington returned to the top half of the table, at the expense of Rangers whom they edged 1-0. Danni McGinley’s 35th-minute goal was enough to ensure all three points for the home side. Hamilton Academical stayed a point above basement side Spartans after the pair played out a goalless draw. Motherwell are still 13 points clear in SWPL 2 after a 2-1 victory at third in the table St Johnstone. 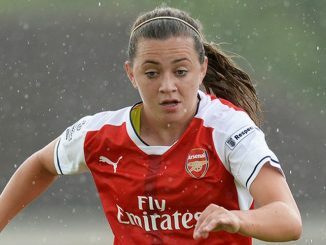 Sammy Hare’s opener was cancelled out by the visitors’ Rebecca McGowan on 32 minutes but Megan Burns got the winner in the second half. Second-placed FC Kilmarnock overcame Edinburgh University Hutchison Vale by the odd goal in three, despite playing most of the match down to ten players. Lisa Swanson and Clare Docherty had Killie two up but then a player sent off. Vale wiped out the advantage with efforts by Lucy Brown and Anna Hume, only for Lauren Sloan to restore the lead. Glasgow Girls climbed to fourth with a 7-2 scoreline at Central Girls Academy, who slip to the foot of the table. Although Central took a 42nd-minutes lead they found themslves 3-1 down at the interval, as Rachel Arnott and a Lauren Coleman brace. Coleman completed her hat-trick on the hour, Megan Logan making it 5-1. Central then got a goal back but Lauren Evans and Sophie McGoldrick added to Glasgow’s tally. One midweek match on Wednesday sees Central Girls play EHUV at Inchyra Park, kick off 6.30pm.